Preheat oven to 180°C (hot). Cube veal and toss in flour. Melt the butter and fry onions. Add veal and continue cooking for 5 minutes. Pour the stock over the top and add salt. Bring to boil, then simmer with the lid on for an hour. Allow the veal to cool, then add chopped ham. 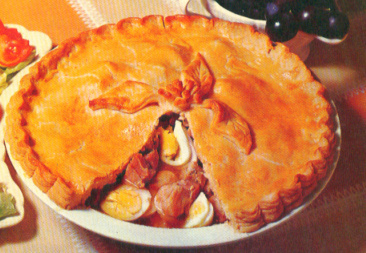 Place ina pie dish, and place sliced hardboiled eggs on top. Cover with pastry (yes, I'll let you use ready-made pastry if you like), and brush lightly with milk. Bake for 20 minutes, then reduce heat and continue baking for 10 minutes.